If you live in the southwestern portion of the United States, you’ve probably heard of Valley Fever. But as a pet owner--especially a dog owner--are you aware of just how serious it can be to pet health? 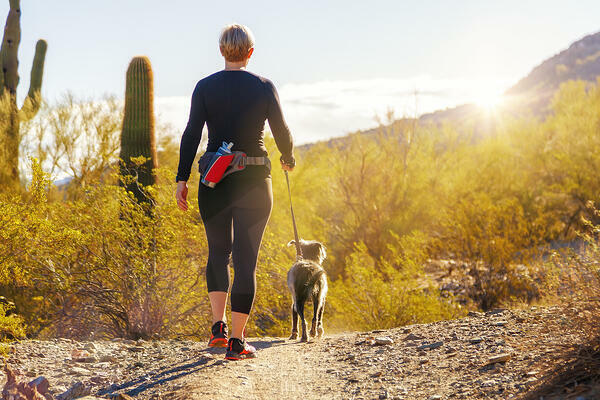 Whether you’re a local resident of Arizona or just someone who loves to travel with your dog, it’s important that you learn as much as you can about the disease so you can protect yourself and your four-legged friend. Valley fever (also called coccidioidomycosis) is an infection caused by Coccidioides -- a fungus known to live in soil located in the southwestern portion of the United States, including Arizona, California, Nevada, New Mexico, Texas, and Utah. Parts of Mexico and parts of Central and South America are affected as well. These areas where the fungus grows in the soil are called "endemic areas." Spores created by the fungus can be stirred into the air by anything that disrupts the soil, such as construction, farming, wind, and digging. Once airborne, the spores can be inhaled. Because of this, the respiratory system is the most commonly affected area (although it can spread to other areas of the body if left untreated). The infection is not contagious. It cannot be passed from animal to human, human to human, or animal to animal. It is only caught from breathing in dust or air that has the fungus spores in it. Valley Fever can affect many types of mammals, including humans. However, because of their sniffing nature, dogs are especially susceptible to becoming infected. Not all dogs who are exposed to Coccidioides will develop symptoms of illness. This is often dependent on a variety of factors including the dog’s age, health condition, and amount of exposure. While some dogs are able to fight off the organisms before they cause disease, others are not. If the disease spreads to other parts of the body, the bones and joints may be affected. Ocular pain, neurological problems, swollen limbs, skin lesions, and lameness are other symptoms that may arise if the disease spreads. Valley Fever is normally a very treatable disease. If you live in an area where Valley Fever is common, your veterinarian will commonly test for it when pets are showing typical symptoms. If you don’t live in an area where the disease is prevalent -- but have recently traveled to or moved from an area where it is -- it is important that you talk with your vet about this travel history should your pet develop symptoms that are consistent with Valley Fever. The most common test used to diagnose Valley Fever is a titer test, which measures the level of antibodies the immune system is producing to fight the infection. Other diagnostic tests, such as blood work and X-rays may also be performed to diagnose Valley Fever. When diagnosed early, Valley Fever can be very treatable. The most common method of treatment is antifungal medication. Commonly used medications include fluconazole, ketoconazole, and itraconazole. Medication may be needed anywhere from 6 to 12 months until your dog or cat has fully recovered. However, pets often begin to feel better within a few weeks of starting treatment. If Valley Fever has affected your pet’s nervous system, he or she may need to take antifungal medication for life. In some cases, antifungal medications can cause damage to the liver. Because of this, your veterinarian may want to administer periodic tests to monitor your pet’s liver function. As mentioned earlier, the fungus that causes Valley Fever thrives in hot, dry areas. Currently, Valley Fever has become epidemic in Arizona, with the highest number of infections occurring during the months of June, July, October, and November. Remember, Valley Fever can be much more than a cough. When gone untreated, this fungus can be a serious threat to pet health. Pay attention to symptoms and have your dog examined by a veterinarian if they become symptomatic.